This article is presented by Friction Gloves; all opinions are those of the author. 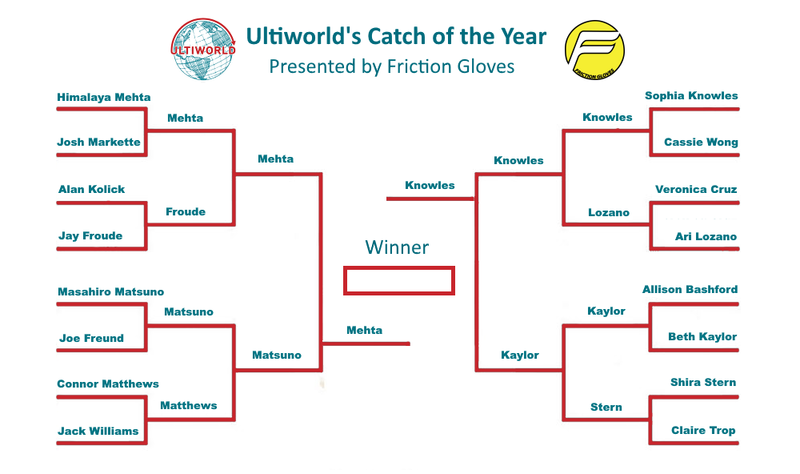 Please support the brands that make Ultiworld possible and shop at Friction! This is it. One final face-off to determine which is the Friction Catch of the Year. The final round of voting starts now and closes on Monday, January 9th, at 5PM Eastern. Take the weekend to let the choice marinate as you consider your vote. Ok, I give. I have seen the light. An awkward half-bid at the end of a broken play mid-way through a meaningless, early-season MLU game is wildly more impressive than I have been giving it credit for. This is the catch of the year. Vote for it. ((Reverse psychology is still a thing, right?)) Or, you know, don’t. Biggest tournament of the year. Double-game point. Brutal wind. Tough, over-the-shoulder read. Ridiculous athleticism. Caps a run of three straight goals when everyone knew the pass was going to her. An exclamation point on a breakout Nationals performance. And a big smile. This is the catch of the year. Vote for it. Unless, you know, you think Mehta’s grab was more impressive. Neither of these plays deserves to be here! Don’t @ me. Which catch should have come out of the women’s bracket, iyo? Voted for Mehta purely because of how salty whoever wrote this is that he made it this far and how salty they’ll be if he wins. So much for a hater! Isn’t this poll really about exposure to Ultimate? And the joy of competition. I couldn’t believe when Mehtacame out of nowhere for that grab (and his name, swoon). And as for a catch that shows the pure joy of Ultimate, whelp, Knowles’s grin at the end and her subsequent swarm by teammates really shows what Ultimate is all about. Get off your pedestal ceisenhood. I said don’t @ me! Just kidding. Everyone has their preferences. Every single catch in this bracket was incredible. I wouldn’t have voted these two to the finals, but the votes are the votes! Well, if Metha wins it is a nice way of saying “goodbye” to the MLU, isn’t it.